Donors who wish to provide a sustaining and lasting gift do so through establishing an Endowed Fund with the Bethlehem University Foundation. The Foundation invests your gift in the United States and uses the interest earned to provide funding for your intention, in your name, each year. Endowed Funds have been established to fund specific Faculties (Schools) or programs at the University, to provide assistance that help Faculties (Schools) grow, to buy equipment, to pay for educational programs, or other uses as specified by the donor. Endowed Funds are managed by the Board of Directors of the Foundation and are invested with T. Rowe Price. With a gift of $30,000, you can establish an Endowed Fund. An Endowed Fund is fully funded at $100,000. With a down payment of at least $30,000 accompanied by the signed pledge agreement below, an Endowed Fund will be established by the Foundation. Many of the Endowed Funds are created by individuals or organizations pooling their donations. Endowed Fund payments can be completed over a period of five years. Click here to view and download an Endowed Fund Pledge Agreement. Creating an Endowed Scholarship at the Bethlehem University Foundation is a perpetual gift that each year covers the tuition of a needy student at Bethlehem University. Thank you for making a difference in the lives of students at Bethlehem University. 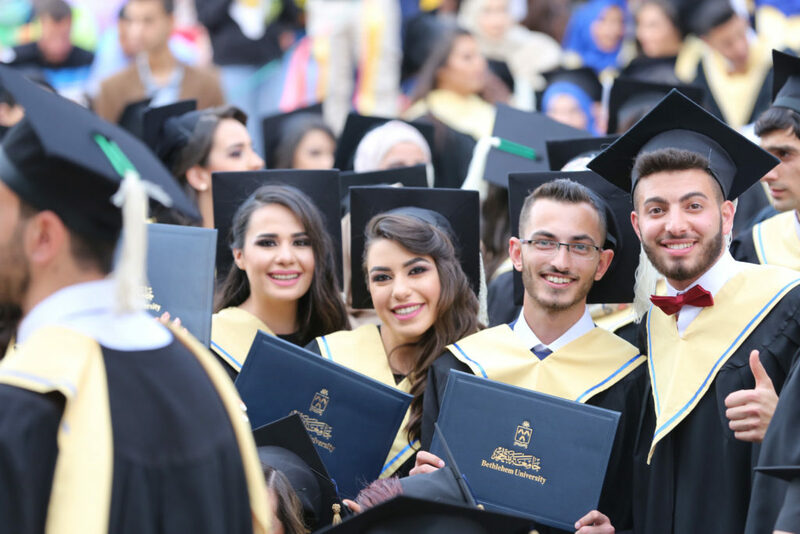 An Endowed Scholarship, named after an organization or in honor/memory of an individual, is a “forever scholarship,” allowing Bethlehem University Foundation to invest your gift and send the annual income to Bethlehem University. Scholarship recipients are selected by Bethlehem University based on need and academic merit. With a gift of $30,000, you can establish an Endowed Scholarship. An Endowed Scholarship is fully funded at $100,000 and will cover the full costs associated with educating a student at Bethlehem University each year. With a down payment of at least $30,000 accompanied by the signed Pledge Agreement below, an Endowed Scholarship will be established by the Foundation. Many of the Endowed Scholarships are created by individuals or organizations pooling their donations. Endowed Scholarship payments can be completed over a period of five years. Click here to view and download an Endowed Scholarship Pledge Agreement.